On August 26, eight students from Gakushuin Women’s College Graduate School visited us to learn about business at the field sites of various organizations that implement international exchange and cultural programs. Deputy Director General Nakano gave an overview of survey and research conducted by the National Research Institute for Cultural Properties, Tokyo. Then they toured the Restoration Studio of the Center for Conservation Science and Restoration Techniques on the third floor and the Japan Center for International Cooperation in Conservation on the fourth floor. Those in charge of each facility provided explanations and answered questions. ON August 28, General Manager Yokoe and one other official visited us. Deputy Director General Nakano gave an overview of the survey and research work conducted by the National Research Institute for Cultural Properties, Tokyo. The visitors then toured the chemical and biological laboratories of the Center for Conservation Science and Restoration Techniques on the fourth floor and the glass film plate cabinet of the Department of Research Programming on the second floor. Those in charge of each facility provided explanations and answered questions. 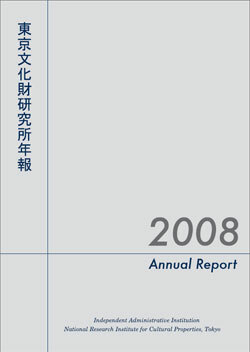 We have published the 2008 Annual Report of National Research Institute for Cultural Properties, Tokyo. TheAnnual Report comprehensively describes what the Institute achieved in its activities last year. The contents include the organization of Institute, annual plans and project reports, other research activities, private research achievements, research exchanges, major stored materials, and Institute-related materials. One copy of the Annual Report are distributed as reference material to each national and prefectural art gallery and museum, prefectural and government-designated city board of education, buried cultural property center, and university library that has a cultural property research department. The Annual Report is also posted on our Website inPDF format. 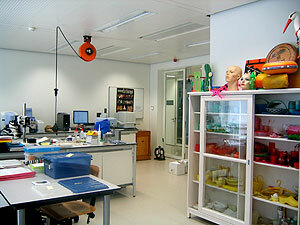 ICN Amsterdam Head Office, Laboratory of Materials. The shelves on the right are full of various plastic products lined up by color. They were collected by researchers at flea markets and other locations. As part of the documentary material research promoted by the Department of Research Programming, we performed a survey from August 2 to 13 centering on the Tate Gallery in the UK and Netherlands Institute for Cultural Heritage (ICN). Various experimental styles and materials were used for modern and contemporary works of art because recently how those works will be passed down to future generations has become a big issue. With one work, the process of decay itself is an innate part of the work, while with another, new materials, including plastics, are used. These are new challenges for the organizations and specialists engaged in the conservation and restoration of cultural heritage. This survey focused on the International Network for the Conservation of Contemporary Art (INCCA; based inside ICN in Amsterdam) and, as a part of the project, the Interview with Artists project performed by Tate in London in which they interview with living artists about their works, archive the records of them and open them to the public systematically. We visited related organizations and listed to relevant personnel in order to find out how Europe is tackling new challenges related to modern and contemporary art. As a noteworthy achievement, we got great suggestions on the issue of originality and the conservation thereof, the topic of the international research assembly held last year by the National Research Institute for Cultural Properties, Tokyo. Additionally, we were deeply interested in the relationship between the three parties – ICN (the Netherlands version of the National Research Institute for Cultural Properties, Tokyo), the INCCA network in ICN, and the Tate, Britain, which is shouldering one INCCA project. They were presenting a model of how a new project should be run while confronting the globally-shared difficult situation, such as shortfall in funds, human resources, and privatization of organizations. We will introduce anew the details on this matter in the Bijutsu Kenkyu (Journal of Art Studies) published by the Department of Research Programming. The Portland Art Museum in Oregon, founded in 1892, is the oldest museum on the West Coast of the US. Among approximately 42,000 works stored in the museum are some 4,000 Asian art works. 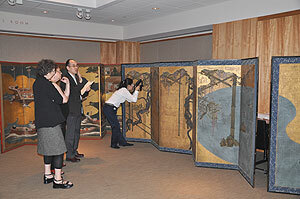 For four days from August 17 to 20, 2009, Mr. Watada Minoru, Mr. Tsuchiya Takahiro and Ms. Emura Tomoko of the Department of Research Programming examined more than 30 works in the Portland Museum produced from the Muromachi to the Edo Period, including Japanese paintings, folding screens and kakefuku and created research records for each work. For works with a poor storage state, they recorded the damage status in detail, and did research and examination from the standpoint of art history, discussing with the curators in charge at the Portland Art Museum. There were some works which have not been introduced up to now and some excellent and important works, and despite the limited time we were able to do significant research. We will announce the results at an Institute research meeting and will introduce those works in the Bijutsu Kenkyu (Journal of Art Studies) and other journals to further enrich the art materials and make efforts toward international research exchange. We recently received an offer of donation of a glass dry plate and prints of swords from Otsukakogei-shinsha Co., Ltd. (Sueharu Sato, President and CEO). Delivery to the Institute was completed on Monday, August 10. The Archives Section of the Department of Research Programming, which received the donation, is planning on organizing the donated materials starting with the prints with an eye toward utilizing both the glass dry plate and the prints as the Institute’s cultural heritage materials. We performed a field survey of the Star Festival Dance (Tanabata-odori) inherited by Osato of Ichikikushikino City, Kagoshima Prefecture as part of the Department of Intangible Cultural Heritage’s Investigation and Research on the Conservation and Use of Intangible Folk Cultural Properties study project. The Tanabata-odori is performed in 14 localities in the Osato District, and consists of dancing with drums (Taiko-odori) played by representative dancers of each locality, large decorations created by all the localities, and various processions. In this field survey, we paid special attention to the practice of continuous dancing for one week, which is called Narashi. 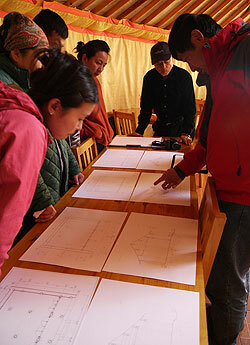 Narashi is mainly carried out by youth groups of each locality, assisted by all the people in the district. Through this cooperation, we can clearly see the way social relationships have been maintained and restructured. On the other hand, we also need to consider that handing down traditions can be difficult, causing a large problem from the viewpoint of conserving cultural heritage. The Center for Conservation Science and Restoration Techniques has been conducting basic survey on traditional lacquerware production as one of its research projects related to the Investigation and Research of Traditional Restoration Materials and Synthetic Resins. 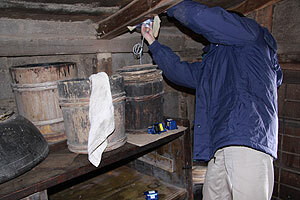 To date, we have conducted a field survey on an Urushimuro (a warehouse for Urushi coating used from Meiji Era to early Showa Era) owned by Mr. Oyamada Seiei in the old Ashiro-machi Iwaya-district (current Hachimantai-City) on the outskirts of Ninohe City, Iwate, known for the production of Johoji Urushi. 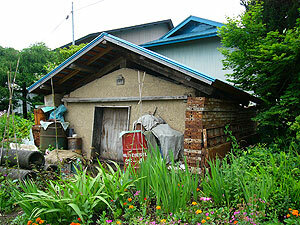 This type of small, locally rooted, traditional Urushimuro is very rare in Japan. By arranging a series of Urushi coating and materials for gold-lacquering, the japanner tools left in the warehouse, we clarified that the flow of Urushiware production belonged to only one workshop; the work environment here was indeed suitable for Urushi coating. We are planning to use the survey results as educational material for the International Course on the Conservation of Japanese Lacquer, which will be held this year. The National Research Institute for Cultural Properties, Tokyo and the Archaeological Survey of India (ASI) are engaged in joint research on conservation of the Ajanta Caves in India in the framework of the exchange program commissioned by the Agency for Cultural Affairs starting in 2008. 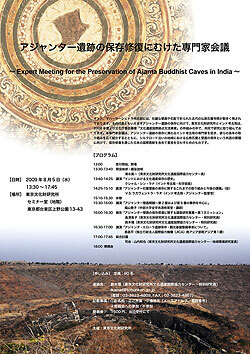 We invited experts in the conservation of the Ajanta Caves and their mural paintings and held this meeting to discuss the common issue of conserving Buddhist stone caves and mural paintings in the area along the Silk Road, along with the international contributions of Japan through conservation and restoration. From the Archaeological Survey of India, we invited Mr. Kushal Singh Rana, the Director of Science (in the project of the Agency for Cultural Affairs to invite overseas artists/experts in conserving cultural heritage) and Mr. V.S. Raghavendra Rao, the controlling officer for the Ajanta Caves. They presented lectures on the conservation of cultural heritage in India and the current issues for the conservation of the Ajanta Caves. 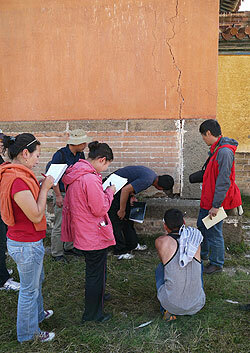 We reported the first mission dispatched by the National Research Institute for Cultural Properties, Tokyo from February, 2008 to March, and exchanged opinions on future conservation and restoration. 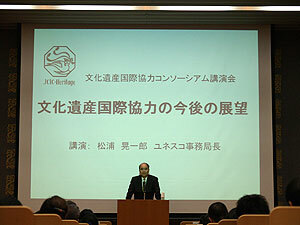 The Japan Consortium for International Cooperation in Cultural Heritage, whose secretariat is entrusted to the Japan Center for International Cooperation in Conservation, invited Mr. Matsuura Koichiro, the Director-General of UNESCO, to the seminar room of the National Research Institute for Cultural Properties, Tokyo, on August 3, for a lecture. At the beginning of the lecture, Mr. Matsuura presented a medal to the President of Consortium, Mr. Hirayama Ikuo, to commemorate his 20 years as goodwill ambassador to UNESCO. Following this ceremony, Mr. Matsuura gave a lecture titled “Future Perspectives for International Cooperation in Cultural Heritage”. He looked back on his track record as Director-General in UNESCO for the past 10 years, and stated the role that UNESCO has played in international cooperation in cultural heritage. Mr. Matsuura discussed the history until the structure of six conventions related to the cultures was established by UNESCO and the significance thereof: 1. The Hague Convention in 1954, 2. The Convention on the Means of Prohibiting and Preventing Illicit Import, Export and Transfer of Ownership of Cultural Property, 3. The Convention Concerning the Protection of the World Cultural and Natural Heritage, 4. The Convention on the Protection of the Underwater Cultural Heritage, 5. The Convention on the Protection of the Intangible Cultural Heritage and 6. International Protection of Cultural Diversity in 1970. He stated that he had anticipated that Japan would make contributions in 1970 conventions, ratify the Convention on the Protection of the Underwater Cultural Heritage, and enhance bilateral aid, thereby building a truly global system based on the six-convention system. The seminar room was full of people, and the lecture was displayed on a monitor in another room for those who could not be accommodated in the seminar room. 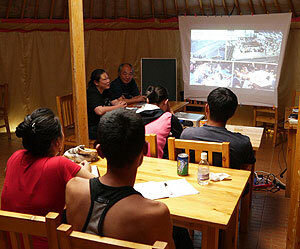 Many people, both experts and non-experts, earnestly listened to the lecture.